Leaving Budva I headed north for Kotor. It was forecast for thunderstorms during the day and whilst riding out of Budva up into the mountains the rain hit me with full force. I had hoped to bike through it, but it was so heavy it was difficult to see ahead. I took shelter in someone’s driveway for a good hour, hoping they wouldn’t either leave their house or come home. After the rains cleared I headed off once again enjoying how much cooler the temperature was. Just past Skaljari I was treated to the most beautiful views of Kotor Bay. It was breathtaking and hardly any people or cars in sight. I slowly made my way downhill trying to take it all in. I cycled past a cute little chapel and heard a very small squeal. I stopped and went hunting for it’s source only to find about a day or two old kitten! I had to have some cuddles and before long Mum came out. I wasn’t sure if they were strays or not but they looked healthy and weren’t hassling me for food. They did however both hassle me for cuddles and I spent about an hour sitting by the road side, the cuteness with Mum and kitten both cuddled up to me! 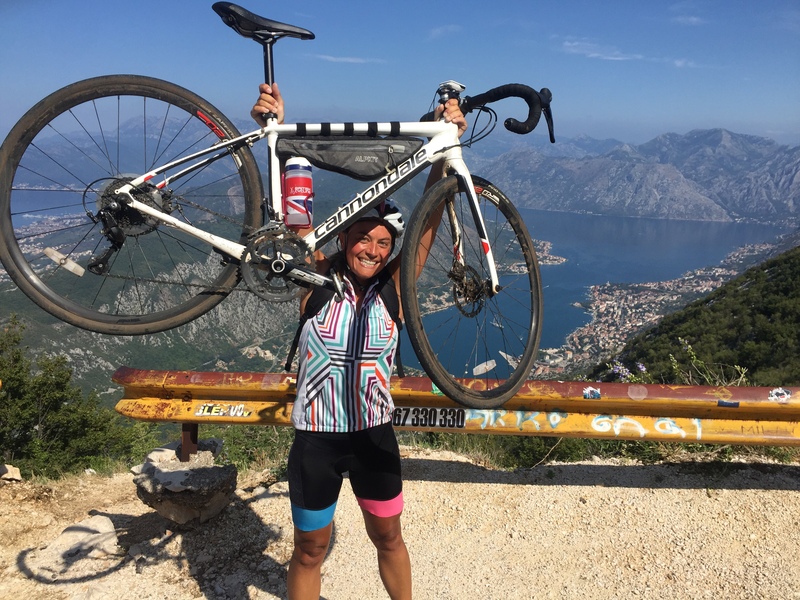 I arrived in Kotor to stop for the night so I could leave my bags where I was staying and do the famous Serpentine climb before heading to my next destination, Perast. Thunderstorms were scheduled again so I decided to set off early so I could bike before any rain and also in the hope that the Serpentine would be deserted. I had lucked out, for about an hour I was the only person on the road, bliss. This famous climb has 25 hair pin bends at a gradient of about 5-8% and for me that felt challenging at times but very manageable. Made me realise how far I had come since hitting the Tyrol region in Austria and being both terrified and ruined within the hour! It did also help so much that I’d ditched the bags as I felt like a feather in comparison. Riding the Serpentine was just magical, words can’t even describe the beauty and peace I felt, most definitely a highlight of the trip. I got to the top and enjoyed the panoramic views of the bay and what I had accomplished before 10am and treated myself to a postcard of the ride. Not before long the motorbikes, cyclists and cars were climbing up and joining me. I then got back on my bike and simply went all the way back down, stopping a few times to once again stop and take in the views. After my climb I headed for my stop for the night, Perast, another town on Kotor Bay. I cycled all around the bay itself, just stunning and most of the time the roads were not so busy and in great condition. Arriving in Perast mid afternoon I decided to stop off at the rocky beach and have a swim to cool off. Perast is very quaint and small, I walked the length of the town in about 10 minutes. After a shower and nap I ventured out for an early sea food dinner, a few glasses of wine and a gelato on the way home. I was sad that I didn’t have more time to explore Montenegro as it was definitely one of my favourite countries for riding, but I was grateful for what I had experienced and just said to myself that I’d have to come back at some point to explore the east side! Leaving Perast I headed for the Croatian border to stop at Cavtat, just outside of Dubrovnik. I arrived in Cavtat around lunchtime and had an expensive but fantastic lunch by the harbour. The waiter saw my bike and asked me about my tour. He was South African and had toured many times. He was impressed with how far I’d bike already and said that it’s so rare to see someone touring around the area I was in that I am something of a unicorn, unique and rare! Must say I’ve never been called a unicorn before but it did make me smile a lot and I took the compliment. I managed to do a full load of washing where I was staying and the next day it made me feel like a brand new person! You can’t describe the feeling clean clothes give you after wearing the same clothes daily when you’re constantly sweating and grubby. This feeling lasted about 10 minutes as I started to feel really unwell all of a sudden whilst packing my stuff. At the same time I was trying to look for my passport as didn’t seem to have it and was scrambling around like a maniac thinking myself crazy as I couldn’t believe I’d ‘lost’ it in the apartment I was staying in! Looking under furniture, turning bags, clothes, etc. inside out trying to find my one most important possession (second one being my bike) I just gave up as I rushed to the toilet to be sick. The sickness passed and I felt better so decided to try and make a move. Handing the keys over to the owner I could have hugged her to death when she gave me my passport! How could I have forgotten she kept when I checked in…perhaps it was the sickness already creeping in. After leaving I had to stop about 10 meters away as I felt really unwell again. I sat in the shade for what felt like hours before actually being violently sick again. At this point I’d been sick a lot so was weak and dehydrated and it was only 9am. It was just 20km to Dubrovnik where I had accommodation booked for 2 nights so knew that even if it took me all day to get there it didn’t matter. And this was how the entire day unfolded. Me cycling about 2 miles before stopping and mostly lying in any shade and waiting to be sick. This was closely followed by quenching my insane thirst with lots of water and about an hour later throwing it all up again. I was spent and had about 5 of these cycles, almost all of which by the road side. Some people stopped to help and ask if I needed an ambulance, some led me to a bar with a bathroom so I could clean myself up and one shouted at me to get off his driveway! Despite the awful sickness and feeling so weak I somehow managed to make it to the outskirts of Dubrovnik and to a pharmacy where I bought rehydration sachets. They looked like ice pops! I didn’t dare drink them until I got to my accommodation as I was worried I would throw them up again and needed them! I got to Dubrovnik and had to take my bike down about 200 stairs as I was staying in the old town. Getting to the centre of town I quickly found my accommodation but saw it was about 200 steps up. I just couldn’t face it, had no energy and just locked my bike up at a restaurant right at the bottom of the stairs. I could have jumped for joy (if I had the energy) when I got to my room for 2 nights. The owner spoke good English and she was concerned about my sickness. The room was lovely, with a big bed, the bathroom really close to the bed and amazing air con. I blasted the air con and just lay there. A few hours later I managed to consume the glucose sachets, taking sips every 2 minutes as the instructions said. I wanted all the medicine to stay in my stomach! The owner was so sweet and text me every few hours to make sure I was ok. I wasn’t sure if I could do anything whilst in Dubrovnik but didn’t care as I was safe and slowly getting better. The next day was a blur, I only left the room once to find some food and tried to take on liquids (no alcohol sadly) slowly but regularly. At least I’d stopped being sick and seemed to be recovering. The day after was my ferry to Bari, Italy so I just focused on getting better and building my strength back up to leave the room! I’d missed seeing anything in Dubrovnik so the day I was leaving I decided to get up early and see if I could manage the old town wall walk before my ferry. I felt so much better so decided to have a basic breakfast, carry lots of water with me and get to the wall for when it opened at 8am, knowing it would be quiet and cooler. I’m so glad it did it, it was beautiful and perhaps the only way I could have seen as much of the city in a few hours. There were hardly any other tourists and whilst it wasn’t cool, it certainly wasn’t roasting hot. The views across the coastline and also into the old town were spectacular, passing by old guard look out points. Despite still being quite weak I was chuffed I’d completed the whole wall in less than an hour – what you can do with fewer people around! I left Dubrovnik with a heavy heart I’d spent most of it in bed, but was thankful I’d seen something of this wonderful city and bid farewell to Croatia!